Guidelines for critical issues in the evaluation and management of acute carbon monoxide poisoning. The mechanism of toxicity in Carbon Monoxide Poisoning is known to be multifactorial, resulting from impaired oxygen delivery to highly metabolic tissues (eg, brain, heart), induced altered function of critical proteins (eg, myoglobin, mitochondrial cytochrome oxidase), toxic free radical formation, and other less well understood actions. Acute poisoning has an extremely varied presentation, from minimal symptomatology to unresponsiveness, hypotension, severe acidemia, or acute respiratory failure. Tissues with high metabolic needs are particularly at risk for dysfunction and injury. Classic presentations involve vague complaints of headache, dizziness, nausea, vomiting, shortness of breath, and/or chest pain. Beyond acute toxicity, CO poisoning is known to be associated with longer-term morbidity and mortality. Neurologic sequelae (either persistent from the time of exposure or delayed in onset by 2 to 21 days) have been described in 12% to 68% of poisoned patients. These sequelae tend to be typified by memory loss, impaired concentration or language, changes in affect such as depression, or parkinsonism and can spontaneously resolve or result in lifelong disability. 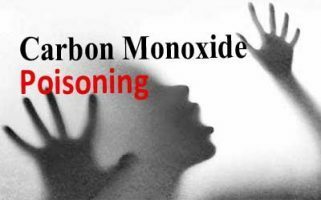 In January 2017 , American College of Emergency Physicians has issued the Guideline for critical issues in the evaluation and management of adult patients presenting to the emergency department with acute carbon monoxide poisoning. 1. In emergency department (ED) patients with suspected acute carbon monoxide (CO) poisoning, can noninvasive carboxyhemoglobin (COHb) measurement be used to accurately diagnose CO toxicity? Level B recommendations. Do not use noninvasive COHb measurement (pulse CO oximetry) to diagnose CO toxicity in patients with suspected acute CO poisoning. 2. In ED patients diagnosed with acute CO poisoning, does hyperbaric oxygen (HBO2) therapy as compared with normobaric oxygen therapy improve long-term neurocognitive outcomes? 3. In ED patients diagnosed with acute CO poisoning, can cardiac testing be used to predict morbidity or mortality? Level B recommendations. In ED patients with moderate to severe CO poisoning, obtain an electrocardiogram (ECG) and cardiac biomarker levels to identify acute myocardial injury, which can predict poor outcome.